It won’t be news to any of you that Christmas is upon us and our December activities have been trying to keep up with that time of year. 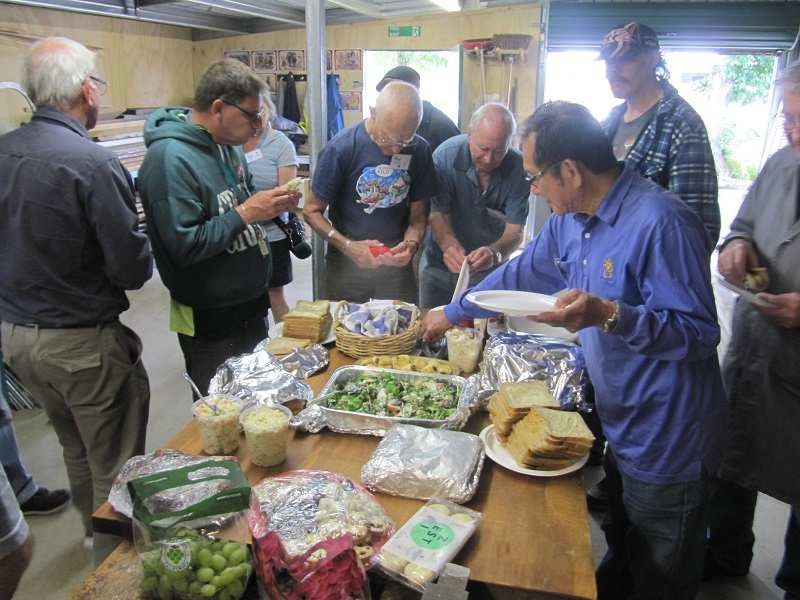 Apart from the Woodworkers Guild end of year function with toys for the Salvation Army and our own BBQ to finish it off, we have had a couple of self-inflicted events with a Saturday of stone carving and another with a wood- turning seminar. Every one of these has gone off without hitch and been a chance for people to catch up and have a chat with some they don’t usually see. The year for the Shed has gone equally well with a steadily increasing number of people joining up, sometimes more a flood than a trickle. We’ve got some great new members with extra skills and all with enthusiasm which is really appreciated. Sadly we have lost some as well for a variety of reasons. When I sent out the last newsletter I got a lot of undeliverables which caused me grief. They were all ‘xtra’ accounts and when I tried again it transpired that they didn’t like being sent out as Blind Copies (BCC). Of course, when I made a list of all the ‘xtra’ accounts on my circulation list I found that the blockage had the inconsistency one would expect from a human being rather than the much-vaunted Artificial Intelligence that we are encouraged to look forward to. I continue to be sceptical that AI will have all the answers proposed. In the event, I have made a list of the ‘xtra’ accounts and they will have to go out as open copies with everyone’s addresses shown. Sorry about that. Protest action is required. ‍I guess it had to happen eventually, but we now have a website up and running for our Shed thanks to Uili Fecteau’s efforts. This means we no longer have to rely on the National one or people finding out about us from Hutt City Council or Citizens Advice websites. Have you noticed how small the Shed has become lately? You would think a logical consequence of building an extension would be to have more room. However, as pointed out above, human beings eschew logic and are more inclined to react intuitively, or in this case, in the most convenient lazy way they can think of. The result is a progressively diminishing amount of space for actual work. One heretical idea I had was that we would have more room if we were tidier, had definite places to put things and actually put them back in such places. Dreaming again. 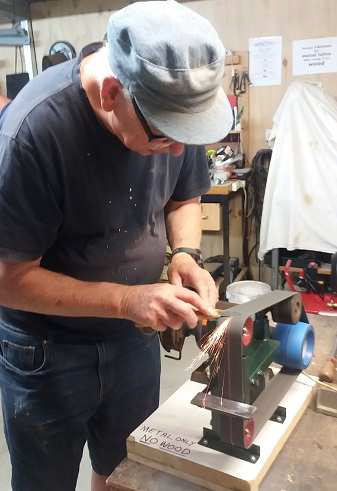 John S is an enthusiastic maker of knives – for wood carving, not politics of course – and was very keen to have a linisher to give them the final polish and sharpening. Not to be outdone by a mere difficulty, Graham E put his thinking cap on and his metal-working skills to the test and came up with a piece of equipment that anyone would be proud of and easily as good as anything one could buy. Being a specialised piece of work, we have taken the precaution of keeping it locked up for restricted use only, if for no other reason that some prat will try and use it running the wrong way and do themselves some damage, or worse still, damage the linisher! I am concerned to have to report that we are missing the spare batteries for the battery drills which were on the chargers and also the guide plates for all the routers. My kindest thought is that someone has put them back in an unlikely place and we need a hint as to their whereabouts. My other thought isn’t! If anyone knows anything about these, could they let a supervisor know. It also underlines the arrangement we are about to introduce of having a container with all items surplus to requirements that members can have for a small donation. It is very great sadness that I report that the Shed lost one of its early and key members in November. Ross Hardie died after a relatively short illness and all the Naenae Sheddies will join me in passing on our condolences and good wishes to Judy and his family. Ross was amongst the earliest of our members to see the benefits of the Shed idea and immediately gave it his fullest and most enthusiastic support. As one of the most practical blokes I have ever met, his ability to come up with solutions to insurmountable problems was legendary. He also had a well-deserved reputation for fixing things, although he often reminded me that when ‘I let the smoke out’ of my power tools, repair was beyond even his ingenuity. When I look at the photos of the Shed over the years, if Ross is in them, he is always busy fixing something, working on the building or helping one of the other members with a project or problem – not quite exclusively, there were some of him sitting round having a cup of tea. From time to time he would try being grumpy but he was absolutely hopeless at it! His sense of humour could not remain hidden for long and his innate generosity meant that he would always help people out whatever the circumstances. 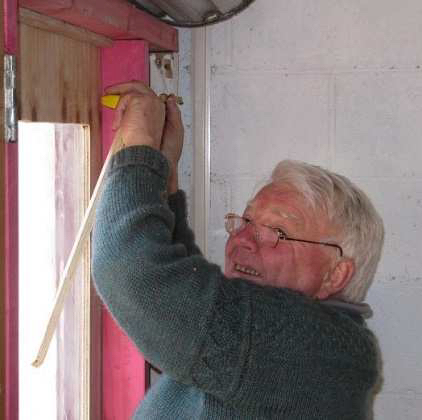 He has been a key member of our Shed from the start and we will miss him immensely. It has been a privilege to know him and be included as a friend. model Harley Davidsons, of which he has a large number. 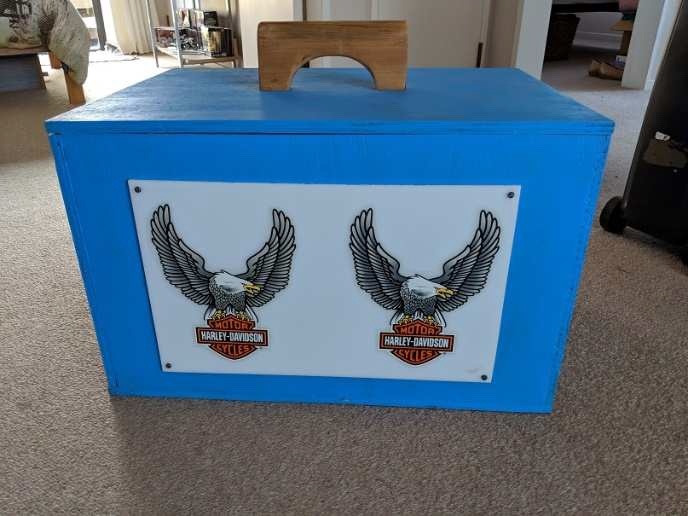 The original box was pretty boringly plain, but once he had painted it up it looked something special. 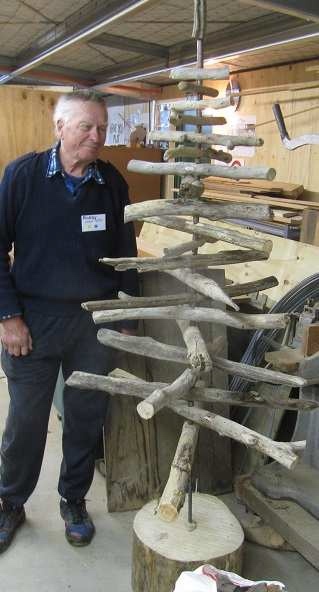 He is now into making walking sticks under John S’s tutelage and thoroughly enjoying that. When Billy was chatting to Muhammad Ali some time ago (it must have been!) he acquired a pair of his boxing gloves and is arranging to have one glove auctioned with the other to be on show at the Academy. 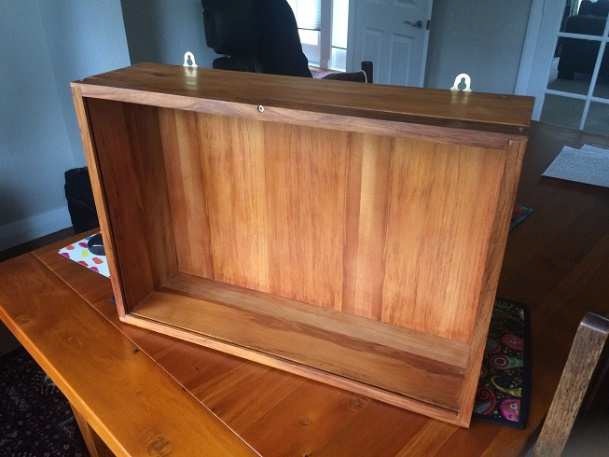 As part of this he wanted two nice show cases made from rimu and with enough room to put some extra photos and information for the winner. Apparently there is plenty of room for other items as the Ali glove is relatively small, although no doubt gets very large if it is coming towards you rapidly. 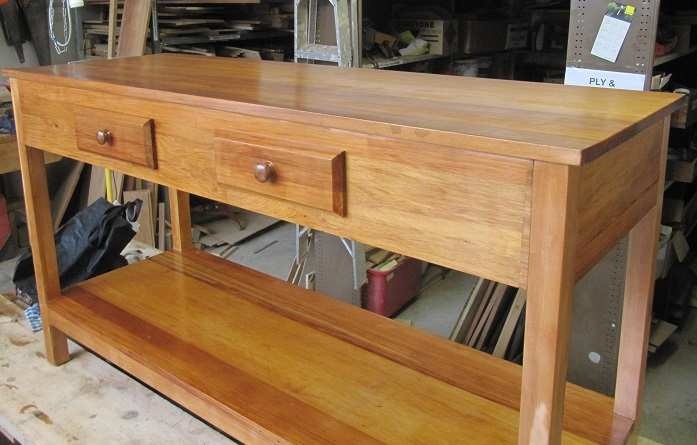 Sam put heart and soul into the project and has come up with two very respectable cabinets that Billy was very chuffed with – one for auction, one for the Academy. ‘just right’ has been noted and very much appreciated. The ongoing saga of the planter boxes for the Women’s Refuge has taken a slight turn with the idea that plants would grow most quickly to cover the 2.5 m high gate if they had a bit if help. Hence the addition of some trellis kindly supplied by a person clearing out their father’s garage. 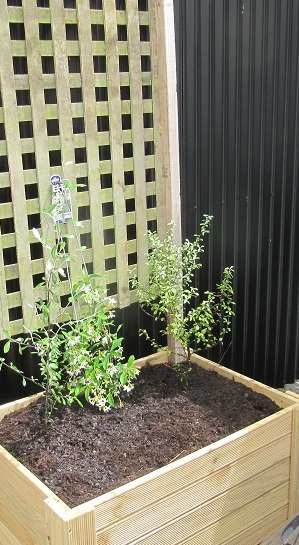 As you can see the box has been filled with potting mix donated by an ever-generous Bunnings. With some plants donated by the Otari Reserve and a rapidly growing jasmine I expect the offending gate and view will be covered fairly promptly – especially if this rain keeps up! During the last school holidays Habib, an avid pigeon-fancier, made a modest sized house for some of his birds which has worked out very well. He now has permission from Naenae College to spend some school time making an even bigger palace for them with small rooms inside (nesting boxes actually). A major part of this activity is for him to learn some construction skills as a prelude to going on to Polytech. It’s great to be able to give him a chance to do this as he has been in NZ for only four years and had limited schooling before this in Afghanistan. I am also very impressed with the school in that they have covered the not insignificant payment required to produce the edifice. ‍This has turned into an ongoing commitment as far as the Shed is concerned. 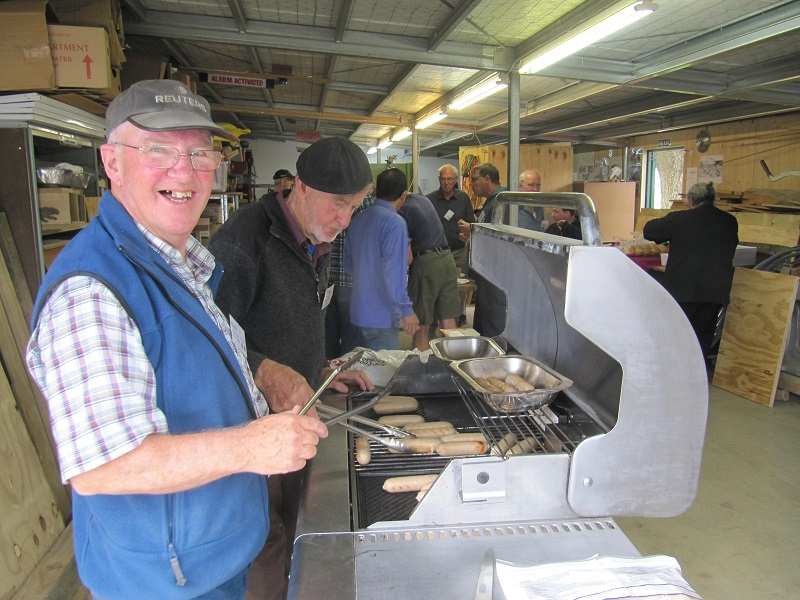 They supply the pallets, we pull them apart and the burgers of Stokes Valley get together and help each other make boxed in areas for gardens in back yards. The latest picture shows that the gardens aren’t the only thing that is growing as community spirit is getting a good boost as well. I have also heard a rumour that the first garden from a few months ago is looking very lush. Great idea and we’re delighted to be part of it. 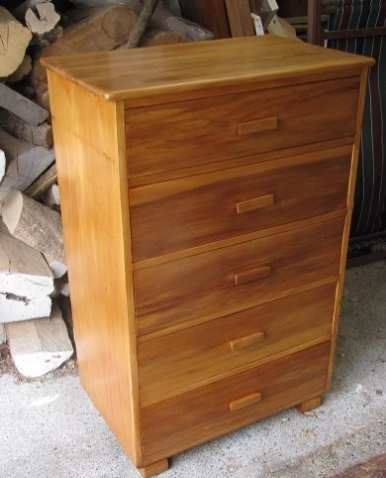 One quick project recently helped a busy man out who wanted a rimu chest of drawers refurbished. I was very pleased to put some effort into this as it was for an old acquaintance from an earlier era of mine. Claire from the Council was wanting to enliven Naenae for Christmas and supplied us with the wherewithal to make a structure that children in various local schools could decorate for the occasion. The design certainly wasn’t the Sheds and even Claire had a little help from Mr Google, but the end result was pretty impressive and had more than a little bit of je ne sais quoi. Robby was impressed anyway. On November 14, the management group had one of their regular meetings. 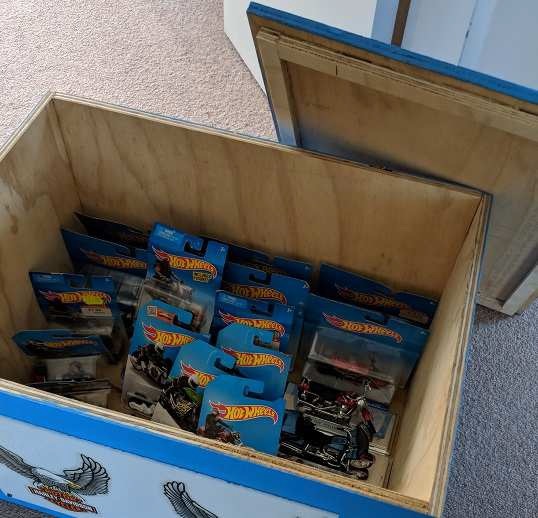 The condensed version of what happened is that we acted on most of the AGM suggestions, especially cutting down on excess tools which is best done by having a definite container with items for members to help themselves - with the inevitable ‘gold’ coin donation to kitty of course. Noted the new website which may also be useful for keeping records more satisfactorily, rather than just on my computer. From my point of view it is very helpful that John Spittal and Graham Reynolds have agreed to deal with job requests. John Walkerdine, Graham Eagles, Jim Easton and Neil Roulston will check out and deal with the regular offers of tools and timber from peoples’ garages. Graham Ramsay has offered to be involved with the finances. Some of these activities need a good system to be developed to facilitate a group working on them and we are now in a position to do that. 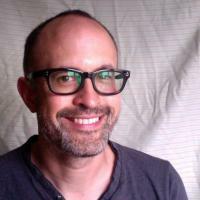 I should also note the Dave Winthrop has done an excellent job of sorting and thinning out the library and has plans to label magazines and also the books by topics. He has promised dire consequences for anyone putting things back in the wrong place! Good luck to him, I say. 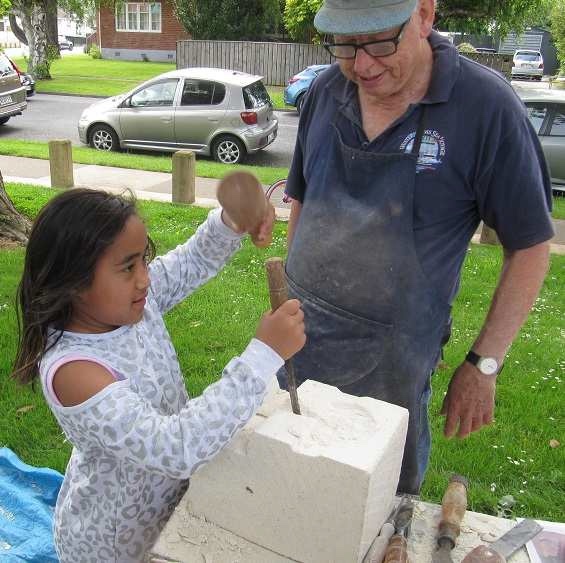 On Saturday, December the 1st, seven woodworkers came along to try their hand at carving Oamaru stone as an alternative. Sam and Archie had arranged the day and supplied the stone from their old stock. There was plenty of enthusiasm and even a young local lady came along to help John S out with his project. 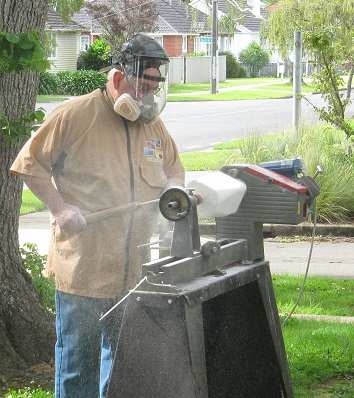 Hugh, of course, couldn’t stay away from his lathe for long and managed to round of his piece of stone (while the rest of us stood well back!). Shed members who are not in the Guild can join and celebrate the two groups working together. Add to that, we are all part of the donations to the Salvation Army of toys that have been made and repaired. It is an indictment on our society in this day and age that there seem to be more and more families who do not have enough to give their children a bit of celebration at Christmas time. It is rewarding to be able to contribute a little, both in time and resources. decorating their work. Clearly, as the photo shows, the interest was riveting and provided an opportunity for people to get new ideas and challenges for their turning. It also unexpectedly provided a very generous donation to Shed funds which was much appreciated. Great work on the tools! promptly and a previous customer also provided a delicious Christmas cake which also proved ephemeral. All together a magnificent way to round of what has been a very rewarding and fun year. and reopen on Monday, January 7, 2019! 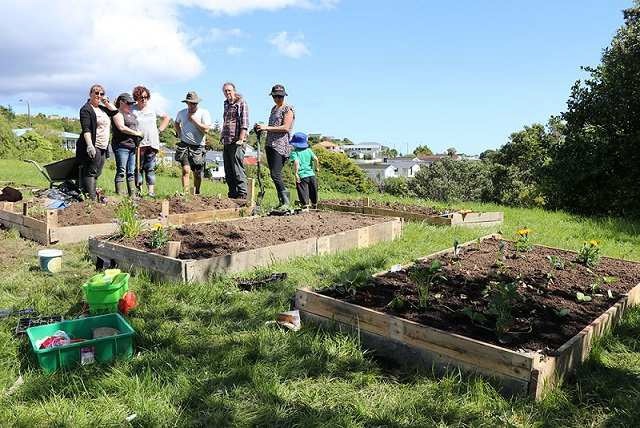 Next Year the Hutt City Council Build & Play trailer programme will be trying a community approach during the school holidays after their very successful activities based at local schools. The Shed will be involved as the venue and any offers to help show children what to do and how to make things will be very gratefully accepted. The programme will run from January 22 to 25 each day from 10 am to midday. The Build and Play Trailer is a Council initiative to provide children a chance to try making things out of any old bits and pieces that we all used to find lying around. They are supplied with hand tools and shown how to use them safely and helped to make whatever their imagination comes up with.